At TechXLR8 this morning, we were treated to a feast of information concerning the growing world of AI. Swisscom dealt with the confusion, Microsoft the good and Deutsche Telekom the bad. So let’s start with Dr Michael Baeriswyl, Head of Artificial Intelligence and Machine Learning at Swisscom. Baeriswyl heads up the group which consults with enterprises to assist them in implementing AI-based solutions; it’s essentially one of Swisscom’s efforts to add value to the community and avoid the dreading relegation to connectivity utility. While there might be a lot of hype around the development of AI in certain circles, this doesn’t seem to be the case in the wider world. Baeriswyl noted there is still some resistance to automating certain business processes, with some customers not seeing the benefits, or perhaps the trust in the technology still isn’t quite there. It appears there is a lot of handholding to be done by Baeriswyl and his team, who have to break down the technology to its simplest form. 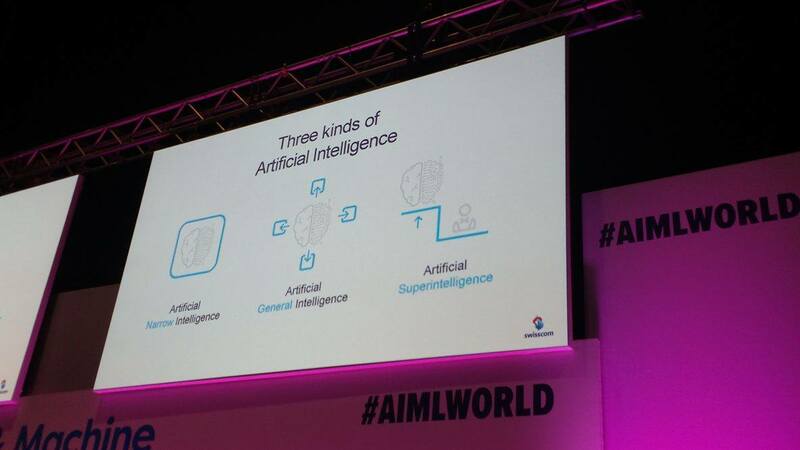 Part of this is by defining the three different types of AI (see image below). Baeriswyl told us that it is very important to make customers understand current technologies are on the left hand side. These are very limited and specific use cases, whereas the right hand side is the all-encompassing intelligence which has been made infamous by many Hollywood blockbusters over the years. Perhaps there is still a subconscious fear that Arnie will appear and take over the world, even if it does sound ridiculous. Or maybe it is just human nature? We reject what we can’t comprehend. In any case, there does seem to be some resistance from the wider community. 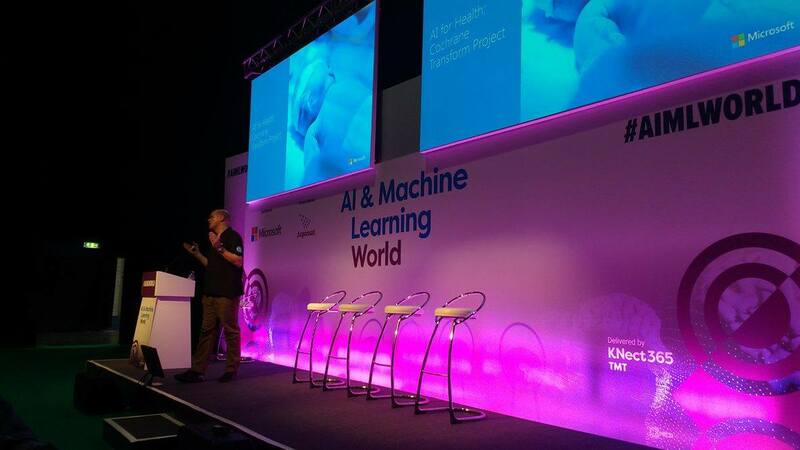 While Baeriswyl was very enthusiastic about the future of AI, Microsoft’s Dr Rob Fraser, did his best to play down fears that the objective of AI is to reduce human expenditure in an organization. It’s a scenario which many of us have come to fear. If a computer can do my job, why should you employ me? Will there be companies in the future will are almost exclusively AI operated? Will this lead to hordes of jobless searching for their next meal? Fraser’s point is that it entirely depends on whether you are a glass half-full or empty type of company. If you are half-empty, you will view AI as an opportunity to reduce costs. If you are half-full, AI can be used to allow humans to focus on areas which can bring in additional revenues. You’re not necessarily reducing overheads, but searching for the next big idea to improve revenues and profitability in the organization. Finally, we come to Deutsche Telekom, and what we took to be the bad side of artificial intelligence. What Jan Hoffmann, VP of eCompany Products at the telco described to us certainly sounds interesting, challenging and rewarding, but there was a slight feeling of doom surrounding it. The talk was focused around AI in customer services, specifically around the development of its digital assistant ‘Eliza’, which is purely focused on DT customer service; this isn’t a competitor to Amazon’s Alexa or the Google Assistant. Right now the assistant is miles away from perfect. The team are focusing on NLP, contextual understanding and creating trust with the consumer. “We want to get to as human as can be dialogue,” said Hoffmann. But to understand our concerns, you have to see the DT objectives. First, the team want to create a self-service platform for customer service. Simple enough, but not AI. Then the team will incorporate more advanced data analytic tools and AI technologies such as NLP to allow this to be the front-most element of the teams customer service operations. Once the customer trust and acceptance has been created, the AI can be programmed to tackle up-selling, cross-selling etc. Surely the high-value tasks which have been earmarked for humans in this augmented relationship would be things like up-selling? If DT is going to be programming its AI customer service agents to take on these tasks, what’s left for the human? Talking to technophobes? It’s worth pointing out that this is an ambition for the moment, it will take years to perfect the most basic customer service AI, get it implemented by customers and then accepted by the mass market. And we haven’t even started working on value adds such as cross-selling. It’s miles away, and we’re not even sure its realistically achievable. However, it is throw away comments like this from Hoffmann which generate the fear surrounding AI. This is a possible example where the ambition of the technology is to make humans redundant.